This crazy weather in L.A right now is the perfect excuse to make a big batch of soup to eat throughout the week. 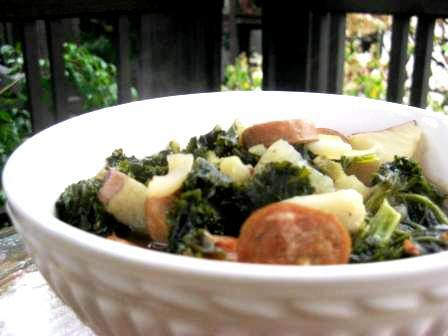 Over the weekend, I picked up some tender leafy green kale from Whole Foods and some organic spicy chicken sausage links with the full intention to use them in this one pot stew. How much easier can this recipe get? It has less than 10 ingredients, and you probably have most of them already in your kitchen! I love how the spiciness from the sausage flavors the soup and the starchy potatoes just soaks up all the broth. This is a great way to get in your greens for the day as kale wilts down a lot and you would be surprised at how much kale you could eat in one sitting! This hearty soup combines fresh vegetables, pantry staples and fresh sausage for a great meal anytime of the week. Try this dish with various flavored chicken sausages and be sure to serve with some toasted bread to sop up all the broth! Heat the oil in a large saucepan over medium-high heat. Add minced garlic, onion, potato and sausage; sauté until slightly browned. Add broth and bring to a boil. Stir in kale, salt and pepper; bring to a boil. Cover, reduce heat, and simmer 20-25 minutes. Remove from heat; stir in lemon juice. LA has been crazy this week with all this rain! I also made a soup with sausage, potatoes, and leeks. Kale sounds like a great substitute for me and a great way to get some leafy greens in there. Love the recipe!